Discussion in 'Hybrid Z cars' started by OwainIJ, Apr 13, 2018. First job after stripping the car will be some small metal repairs in the floor, converting the bulkhead and fitting the new engine and gearbox mounts so will post some updates during this. Appreciate any tips or advice! Also would be good to get some tips on what diff setup people have used in they're VQ swaps?? Still undecided on whether to put in a LSD. I would say an LSD would be essential to enjoyment on a light rear wheel drive car with oodles of torque. Have you looked at the quaife ATB? Just had a quick look. Do you have any experience installing them? It depends on your budget but by the time you have sourced all the parts to put a Subaru one in you would probably be looking at the same amount as a quaife. All my money is going into getting the 1jz in and running at the moment. I will be running standard suspension, Diff and brakes to start with whilst I save up (driving carefully). I will likely do brakes, then suspension with diff lower down the list. Unless something breaks which would then be upgraded. Plans sound good, you have a lot of work to do, good luck. I would be looking to run an R200 with an LSD, The quaifes are good but I have to say my OS Giken Superlock 1.5 way CLSD is the best LSD I have driven with, its so smooth when driving normally but can lock up nicely when required for serious driving, its very quiet for a CLSD, night and day difference to my mates Nismo CLSD in the R200 in his Skyline. Hows the progress going? Have you figured out what you'll do with the heater pipes/matrix etc? Quick update. Car is now stripped and ready for shot blasting and priming. Found some small patches of rust and some old repairs that will need dealing with (the cars has had a new roof put in at some point) so some extra welding added to the list of things to do. On the diff front I'more likely to put an LSD into the existing diff case than replace it. I think the most likely option with the heater matrix will be an aftermarket kit of some kind. The old heater/ac unit is bound for the scrapheap. I have kept the sliding switches and fascia though as it might be pretty nice to try and keep the look but with a modern system behind. I am tempted to see if i can transfer across the heater/ac system from the 350z I have as I'm planning on taking the wiring harness from that car. Might be a bit too much work though and I have no idea if it would actually fit. As the 280z is away being shot blasted I've cracked on with stripping down the 350z. Its taken the best part of a week and was an absolute nightmare of a job but the engine & gearbox are out along with the various harnesses. Have a couple of options going forward on the setup of the 280z. I have taken out and kept all the parts needed (IPDM/BCM/NATS Antenna e.t.c) to get the VQ engine running with the anti theft system working. Or I can get the NATS removed. Horsham developments charge £250 to flash the ECU to take away the NATS. Not sure which avenue is best to go for. removing the system would make the install into the 280z way easier but would be usefull to have some sort of immobiliser on the car. Any thoughts or advice? I believe you can get away with just a few of the smaller brackets and drilling a LHD firewall? Not sure dude, others are experts on that front. Already bought the kit...one of my first jobs to do once the car is back from shotblasting is to work on the bulkhead. I reckon that's been rolled at some point in the distant past. Might be worth getting the unibody on a jig at some point and seeing if it is twisted or not. Why do you reckon its been rolled? thats quite extreme. Could just be heavy side impact damage on that rear quarter from an non flat object. Because it has similar damage on the other quarter, and it's had a new roof. My gut tells me its been rolled which is a bit of a nightmare. Have found someone in Canada who will make the full rear quarter panel. Doors/front fenders/Hood don't have any matching damage or any filler so either they were replaced or somehow not damaged. All panel gaps/doors/hood and boot lid all fitted fine when the car was together. When would be the best time to get it on the Jig? Before putting in any of the repair panels? Doors/front fenders/Hood don't have any matching damage or any filler so either they were replaced or somehow not damaged. All panel gaps/doors/hood and boot lid all fitted fine when the car was together. When would be the best time to get it on the Jig? 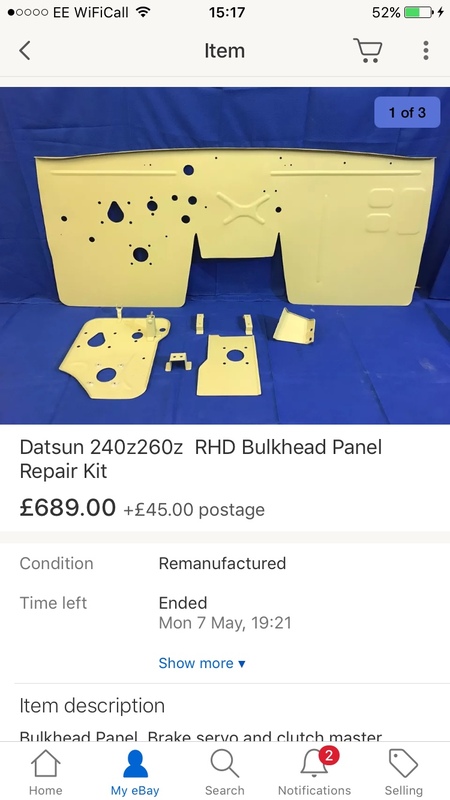 Before putting in any of the repair panels? If it was a fairly light roll then maybe it will have got away without a twist or bend, but the fact that it's had a roof panel change makes it hard to judge how bad the roll was. If it was my car I'd want to ensure it was actually plumb before doing any body repairs. If it needs any rectification it's much better to do that before anything else. If you can get it onto a good flat surface you could do a lot of checking with plumb bobs and a measuring tape. Blasting certainly reveals hidden horrors - it's happened a few times on here. I would echo what Albrecht advises - get it all measured now and go from there. No point in doing any repairs at this stage. It has some rot but is very sound from the pics. US body-shops seem to bodge things from the limited knowledge I have. I'd be cautious of reproduced major panels like rear quarters, especially when you can't go and see their work beforehand.